All knowledgebase categories > SEO SpyGlass > Checking backlinks availability in 'Links back' column. The 'Links Back' column shows if the selected backlinks are still in the right place. You may check here if the backlink still leads to your site and if it is not hidden or covered with <nofollow> tag. 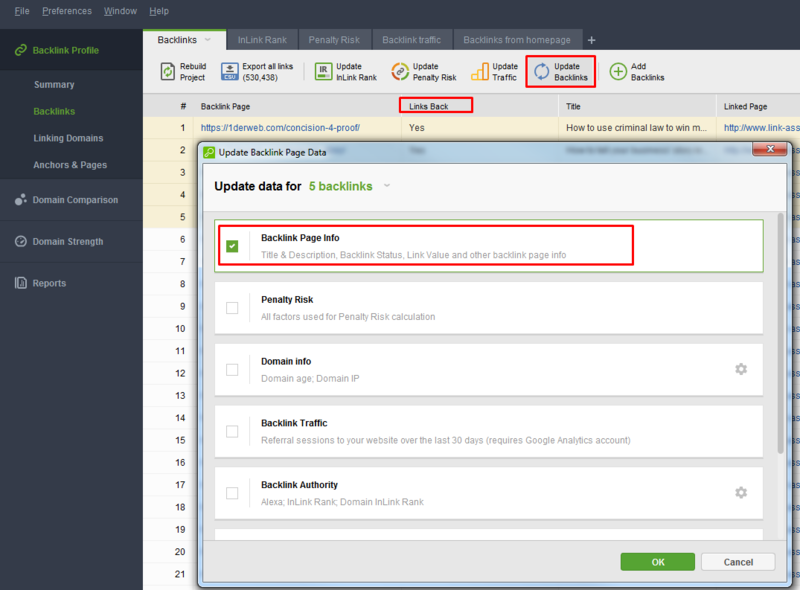 Click Update Backlinks on the main toolbar and mark the 'Backlink Page Info' checkbox. The application will visit the backlink pages specified and will check them for availability. If a backlink is available, it'll have 'Yes' in the 'Links Back' field. Otherwise it'll be marked as 'No (Nofollow tag)' or 'No (Site is down)' or 'No (Link missing)' and so on depending on the reason it has failed verification. If you don't have the 'Links Back' column in your work area, you can add it via the 'Edit Workspace' menu (right-click on the header of any column to activate it). Please visit this link to know how to add a column to your workspace.